He married Bettie Louise Herrin.1 Bettie, daughter of William Terry Herrin & Flossie Dale Phillips1,3,7, was born May 15 19331,3,7 [Apr 15 19335], Guilford County, North Carolina1,3,7. Franklin Thomas Hinshaw, Sr., 80, of Carolina Beach, NC, and formerly of Leland, passed away on Monday, December 16, 2013, at his home. He was born in Randolph County, NC, on December 24, 1932, son of the late Carl Cyrus Hinshaw and Hazel Jeanette Stout Hinshaw. Mr. Hinshaw had been a Deputy Sheriff of Randolph County, NC. 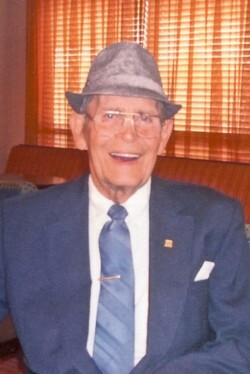 He was a commercial fisherman in Carolina Beach, a master carpenter, pipefitter, welder, and farmer. Mr. Hinshaw and his wife, Bettie, also operated a commercial egg grading business for over twelve years. He loved flying, telling stories and jokes, and was a member of the Federal Point Masonic Lodge #753 A.F. & A.M. since 1981. Surviving is his wife, Bettie Herrin Hinshaw; children, Teresa D. Springfield and husband Don of Wilmington, Linda H. Proetsch and husband Jeff of Carolina Beach, Donna (Jan) Matthews and husband Terry of Leland, and Steven L.Hinshaw and wife Rosanne of Virginia Beach, VA; twelve grandchildren and eight great-grandchildren; a brother, Paul R. Hinshaw of Asheboro; sisters, Alese H. Grimes of Ramseur and Eleanor H. Gunter of Asheboro; and his Jack Russell dog, Ajax. Preceding him in death was a son, Franklin T. Hinshaw, II, brothers, Walter L. Hinshaw and Myron L. Hinshaw; and a sister, Mildred H. McAlister. The family will receive friends from 6:00 p.m. until 8:00 p.m. Thursday, December 19, 2013 at Andrews Mortuary Valley Chapel, 4108 South College Road, Wilmington. A memorial service will be held at 2:00 p.m. Friday, December 20, 2013 also at Andrews Valley Chapel with the Rev. Joey Canady officiating. Flowers are welcomed or memorial donations may be made to the American Kidney Foundation. Contribution from Donnie Springfield (). Obituary of Mildred Marie Hinshaw. Obituary of Myron Lawrence Hinshaw.